Housed inside a lignin-free archival box, The Gorgeous Nothings includes a guide to the envelope-poems of Emily Dickinson (1830-1886); a 52-page letterpress booklet by Dickinson scholar Marta Werner; and a portfolio of 47 double-sided manuscript facsimiles.The original cover drawing on the box lid is in blue pencil and has a hand-painted seal of gum arabic and gouache. 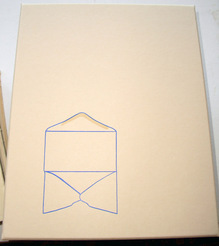 The edition, published by Granary Books, is accompanied by a guide with a bibliographic directory for the fragments and a series of visual indexes. 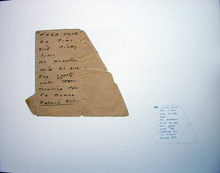 The 47 manuscript facsimiles show the front and back of each Dickinson envelope-poem printed at 1:1 scale accompanied by smaller visual transcriptions in blue. 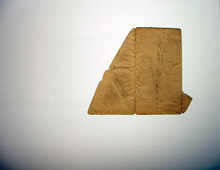 A close-up of one of the fragments is seen above. ‘the gorgeous nothings which compose the sunset keep’. 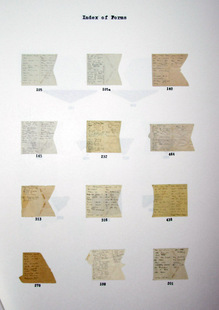 Marta Werner’s essay, “Itineraries of Escape: Emily Dickinson’s Envelope-Poems,” includes seven digital prints. The cover, bound in Saint Armand Dark Linen with royal blue Shikibu Gampi-shi endpapers, replicates the page forms of A821 / A821a. The text is printed letterpress by Friedrich Kerksieck on Byron Weston Linen Ledger White. 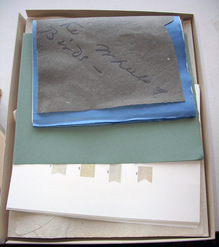 ©The images of the manuscripts of Emily Dickinson are reproduced courtesy of Amherst College Library, Archives & Special Collections, The Houghton Library, Harvard University, and the Harvard University Press. The President and Fellows of Harvard College claim the sole ownership of and sole right of literary rights and copyrights therein to the texts of Emily Dickinson. are you interested in document and record preservation?